NEW ORLEANS – Southern Baptists made history on Tuesday by electing their first African-American president. 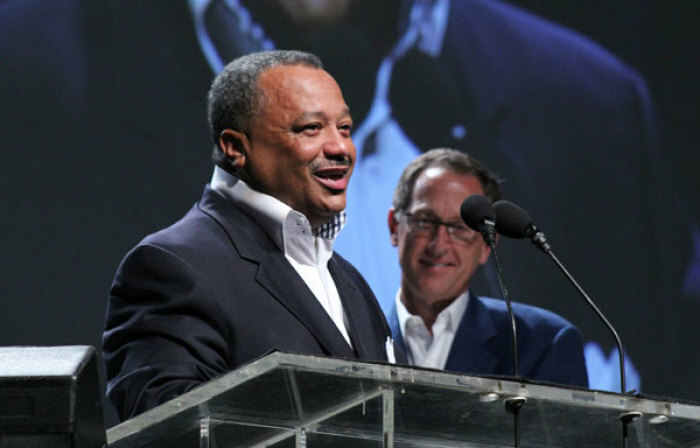 Some 7,700 messengers unanimously and enthusiastically supported the vote for Fred Luter, Jr., to lead the predominantly white denomination. 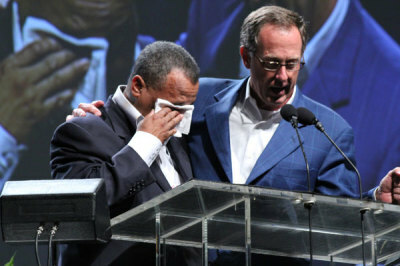 "To God be the glory for the things that He has done," Luter said as he wiped away his tears. Luter was the sole nominee for president. In such a situation, it is custom for the secretary to cast the ballot for the one nominee. However, the chair on this occasion believed that "this historic moment should fully belong to the messengers of the Southern Baptist Convention." With that, the Southern Baptists rose in applause – with some in tears – agreeing that the ballot should be cast for Luter. "As we think about our beginnings, as we think about how far we have come, as we think about how you have divinely called Fred Luter for this key moment in history, we just thank you for the privilege of being a part of this day and we thank you for how you are going to use Fred Luter in the days to come," Bryant Wright, who served as SBC president for the past two years, prayed. It was less than 20 years ago when the Southern Baptist Convention officially apologized for condoning and perpetuating racism. The SBC was formed in 1845 out of a split with northern Baptists over the right to own slaves. Many in the denomination supported segregation. Luter, 55, admitted that when he was first asked to lead an SBC church – Franklin Avenue Baptist Church in New Orleans – in 1986, he was not aware of the history of the SBC. If he knew, he said he might have taken a different path. "As I look back I'm probably glad I didn't [know] because it may have changed my decision," he told The Christian Post. By the time the former National Baptist found out three years later, he was already involved in leading Franklin Avenue church – which was an all-white church before the "white flight" – and said the denomination had been "really good to us." "When I found out ... this is the way I looked at it, because some people said we ought to get out of the convention. I said listen, all of us have a past, all of us have done some things in our past that we're not pleased with; I know I have. "Granted, this convention started as a result of slavery but that was the past. There's nothing we can do about our past but we can do something about our future." The former street preacher is excited – he's excited that his Southern Baptist brothers and sisters respect what he has done through the years, like reviving a dying church and rebuilding the congregation after Hurricane Katrina. And he's excited that the nearly 16 million members trust him to lead the largest Protestant denomination in the country. He knows it's a big deal, considering he was just "a street kid from the Lower Ninth Ward." Luter isn't your typical Southern Baptist president. He grew up in "the hood" as he calls it. His parents divorced when he was 6 years old and he raised himself as his mom was busy working two to three jobs to support the family. He hung out with a lot of "crazy dudes" as a teenager, he said. But everything changed when he got saved in 1977. Every Saturday at noon, he'd go on the street corner and preach. Part of his motivation was to lead the "crazy dudes" to Christ. "I really was excited about what God did in my life," he explained. "When you first get saved, you feel like you can go to hell with a water pistol and just do a drive-by. That's what I felt like." Now, as he stands at the helm of the SBC, he's not looking at the past but rather the future. He sees a denomination that's been talking the talk and is now walking the walk when it comes to racial reconciliation. "This convention has through the years tried to repair that image of starting out in slavery," he said. "Richard Land and I were on the commission ... back in 1995 when they presented the resolution to apologize for slavery. Then last year ... the executive committee made their report about wanting the convention to be more multiethnic and that came from the top. "And now this year after saying that it's like 'alright y'all, we've been talking it, now it's time to walk it. That's the great thing I love about [today]."